Every record collector goes through inevitable selling phases depending on where their bank account is at. During times of economic starvation we have all turned to our vinyl and begun the almost comical act bargaining with ourselves. We each have our own little ways of deciding what to keep or sell and it can change depending on just how broke we are. My recent sad financial state has forced me revisit my collection and play the game of worth (IE doesn't make it to the sell pile) verse what I am willing to surrender for a few dollars. As I painstakingly nitpick at some 4,000 records I am a amazed at how many records have somehow never managed to be played, with many still wrapped snugly in its original cellophane with the seal unbroken. In fairness I have been seriously collecting records for some twenty plus years so with a fairly large collection it becomes nearly impossible to listen to much of it on any regular basis. It is at this point I have to ask myself a very important question... (okay, only important to a record nerd facing the dreaded situation of having to sell records because you are broke) if I have never played this record and it has been over a year no less 5 or more years, has this record really earned a permanent place in my home? When you are as broke as I am, my new answer to this question is no. If I haven't played a record EVER it probably shouldn't belong to me and will more than likely find a better home somewhere else. Its pathetic to think about my records as if they have feelings but I truly feel like if I haven't given a record proper love and attention, it deserves a better home with someone who will love it and take it out every now and then. The only upside I can say to this process of going through my records with a fine tooth comb is it is forcing me to think about the music I own, why I own it, and how the record made it to my shelf in the first place. 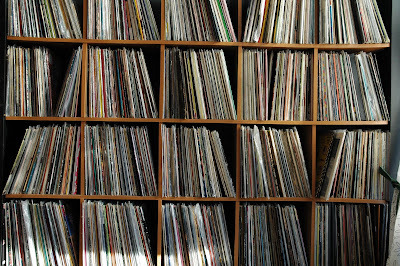 Most music nerds will agree with me here, some people have scrap books and photo albums to capture memories, we have records. An enormous part of my collection carries some serious memories for me and marks my growth into adulthood like pencil marks in a door frame from my childhood home. The records on my shelf reflect so much of my life: the friends I have or have had, the bands I have played in and have toured with, the parts of the country I have lived in or traveled to, the stores I have worked in, family member's gifts or hand me downs...the list goes on and on. This will be hard for some people to swallow but as a woman with zero interest in having children my collection is the closest thing to having any offspring. My records when lined up on a shelf are practically a DNA chain of who I am to my very core. This is also why selling off portions of a collection can be both devastating and cathartic. There is a fine line between genuine loss and cleaning house and this month has been dedicated to that tightrope dance. What this really all means is a healthy portion of my record collection will be making an appearance in the bins at the record store I work in. I like knowing my past is being literally brought (bought) into the present...assuming somebody....maybe even you....buys it. I know exactly how you feel---except on a smaller scale! My records are safely nestled within Sean's much larger collection so I don't often reminisce over them. However, there were times when I was doing my degree and was broke when I would look at my CDs and wonder "What was I thinking?" or "I could never trade that in!" Culling a collection is tough! PS I was really bummed to hear about what happened at your warehouse. I am wishing for good things for you and the business! I understand completely Tracy. I try to unload cd's when I need money. I just don't have the same sentimental feeling towards cds as I do vinyl.